Rustam Huseynov is a truly extremely talented soul and this comes out through his works. 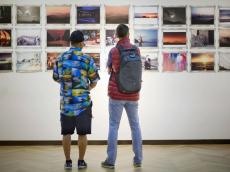 Azerbaijani photographer successfully represented the country at Busan International Environment Arts Festival. The event displaying eco-friendly artwork brought together world-famous art professionals. Both works devoted to contemporary trends in visual art, as well as works on historical topics related to current events in different parts of the world. "The festival is one of the largest international festivals in Asia in the field of visual art," Rustam Huseynov told Azernews. The photographer brilliantly captured beautiful moments showing the wondrous diversity of old and new trends. "My work made a great impression, as it reflects the tendency of combining historical heritage and modernity, which is now popular around the world, including South Korea", said the photographer. His impressive works showcases his incredible talent, as well as his keen eye for capturing the captivating colors. So, there was no doubt that the works of national photographer would cause a great success among art connoisseurs. The art festival in the beautiful port town of Busan made a deep impression on him. The festival impressed the photographer with a huge number of participating countries. Undoubtedly, Rustam Huseynov took home wonderful memories from the festival. "The most pleasant impression for me was the exhibition catalogue, where my work looks both as an object of digital art and as a historical miniature at the same time," he said. Earlier, Rustam Huseynov presented his works at the exhibition "European architectural heritage of Baku" at Center of Contemporary Art. The exhibition combined in the greatness of the Western styles has always coexisted with the elegance of the East for centuries.